Farro, Radicchio, and Roasted Beet Salad - A recipe from Savor California, the online showcase for extraordinary gourmet foods and beverages from California. Arrange beets in single layer in 8 x 8 x 2-inch baking dish. Drizzle with vegetable oil. Cover with foil and roast until beets are tender, about 45 minutes. Cool. Trim beets; peel. Cook farro in large saucepan of boiling salted water until tender, stirring occasionally, about 20 minutes. Drain. Transfer to large bowl. Stir 2 tablespoons olive oil, 1 tablespoon vinegar, and garlic into hot farro. Cool to room temperature. Cut each beet into 6 to 8 wedges. 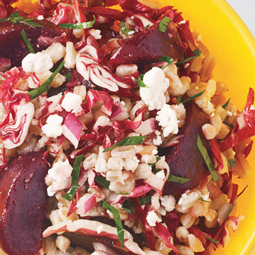 Add beets, radicchio, onion, and parsley to farro; toss to incorporate evenly. Ingredient tip: This recipe calls for semipearled farro, a version of the grain that doesn’t require soaking before being cooked. If you're using regular farro, it will need to soak overnight. Farro is available at specialty foods stores, natural foods stores, and Italian markets.